Many Coffee lovers are confused when they walk into a cafe. 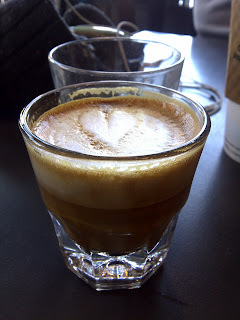 Its a shot (or two) of espresso with a very small amount of milk. A 1:1 ratio of milk to espresso. More milk and less foam than a Cappuccino. Allowing the milk to cut any unwanted acidity. Leaving the drinker to experience milk-coffee goodness. Maybe this can help those that don't enjoy straight up espresso-- to slowly ease into the addiction of amazingness that you are missing out on. Happy First offical Espresso Anniversary!!! Keep it locked for the celebratory warp-up post of what happened last week. Bundle up its -18, -20 this weekend. Enjoy an espresso indoors.